Home / Microsoft Word / How to do multiple cut paste in Microsoft word? How to do multiple cut paste in Microsoft word? Microsoft word is a very essential tool in our daily life. It can simplify and make more things easier than most users of this word processing software know about. It is always fun to discover new features in MS-Word and then use them with joy. MS-Word has a feature that enables you to hold more than one data pieces in clipboard and then paste all of them in one go. This is called Spike. 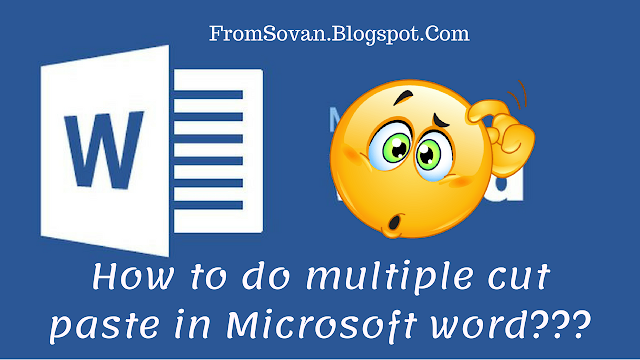 Today I will show you How to do multiple cut paste in Microsoft word. It is an area in your computer’s memory where text and images temporarily reside when you copy or cut them. When you issue a paste command –the data shifts from memory to the new location where you have pasted it. Clipboard is an invisible entity; you cannot see it on screen. You know what is clipboard –let’s see what is special about Spike. Regular clipboard can hold 24 piece of text or image at any given time. After 24 pieces, when you copy another piece of data –it overwrites the data that was already there in clipboard. This is where Spike comes into the picture. It is an extended clipboard which can hold multiple pieces of data. Therefore, in case of Spike, incoming data pieces do not overwrite the existing data. Select the text, image or any other object that you want to put in Spike. Now press CTRL + F3. The selected data will get cut from the original location and will be shifted to Spike. Select another piece of data and again press CTRL + F3 … this piece will also be cut and append to Spike. You can go on cutting data pieces like this. When you’re done, put your cursor in the new location where you want to paste all the pieces that you’ve just put in Spike. Now press CTRL + SHIFT + F3 and like a magic all the cut pieces will get pasted at your cursor location. It is very easy, isn’t it? Note 1: You can also paste all the cut pieces in a different MS-Word document. The target location does not necessarily be in the same document. Note 2: Once you’ve pressed CRTL+SHIFT+F3 all the data will be pasted in new location and will be erased from Spike. So, you can paste data from Spike only once. Note 3: After putting some data pieces in Spike, if you press CTRL+C (for regular copy) or CTRL+X (for regular cut) all the data in Spike will be lost. I always believe “don't work hard but work smart”. Hope this tip "How to do multiple cut paste in Microsoft word?" will help you. If you have any question, query or problems then please write in comment section or you can contact me at fromsovan@gmail.com. Dear Subhendu, Thank you for your comment and suggestion. I will definitely increase the font size in future post. Stay with me. How to Copy Text from PDF to Word Document without Line Breaks? How to Remove Password from Excel (Unprotect an Excel) without Software?